Broadway Window Treatments can assist you in customizing any window covering. Function should be considered first. Window treatments must address your needs. Light control, privacy, insulation and view are important factors. With so many new innovations and technologies, window treatments can achieve this while still being design savvy. Pay attention to your room’s architecture. The pewter silk bands in the drapes match the wood trim that separates the windows. These types of details allow your eye to continue to travel around the room and even accentuate the beautiful wood trim. You don’t have to have a sharp contrast in color if you use fabric with different textures in the same panel. Make it about the details. Decorative embellishments like finials on the rod, medallions and tie-backs with big tassels make a window treatment look very rich, but not too busy. The correct height of the drapes is necessary. There’s no formula, but for a grand room, the floor-to-ceiling drapes create a feeling of elegance and grandness. For a less formal and intimate space, you may want them lower to create a more cozy feeling. Get the proportions right. Consider the space around the window, the size of the room and the view from the inside and out. You don’t want to overdo or skimp on the window treatment. It should be like a picture frame for the window — it can be embellished and accessorized, but must maintain both function and balance. Hardware is very important. The rod you use is part of the equation for creating a beautiful window treatment. Here, we used an invisible rod. But if you go with a very simple drape, the rod is a much-needed feature and should make a statement. Layer different materials to add interest and dimension. It creates movement without a sensory overload. Combining colors in the drapery panel is a great way to show you put thought into the treatment. It can also be a great way to integrate colors in your decor that are difficult to find together in an existing fabric. 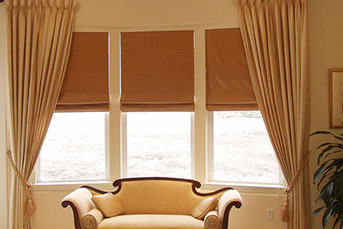 Window Treatments play a dramatic role in the overall atmosphere within each room. Learn about the different options and styles of Custom Window Treatments that are available from Broadway Window Treatments. Curtains and drapes are window coverings that are created from cloth materials. A person can can select solid color curtains or draperies for a room or choose from a printed pattern that will complement the decor or theme that is desired for the room. These window treatments can be closed to block light from entering a room or left open. Most commonly, curtains and draperies are pulled to the sides of the window and secured with a tie. Draperies are created to hang from the top of the window to the length of the floor for a look of grandeur within the room. Blinds are window coverings which allow adjusting the amount of light which can filter into a room. These window treatments are comprised of slats, which are positioned in a horizontal or vertical manner and can be adjusted with the use of a cord or rod. Most blinds are capable of having all slats pulled to the top of the window so it allows homeowners to have a full view of the outside. Window Blinds are created with materials such as wood, faux wood, metal or fabric. Window Shutters are window coverings that are secured to the window frame of the window. Shutters feature slats of wood, fabric and other materials which are secured to a wooden box frame and can be adjusted to allow light in or out out of a room. Window Shutters come in many different color options, and depending on the materials in which they are constructed of, they can be painted to match the color scheme of any room. Window Shades are window coverings constructed of materials that are wrapped around a roller that fits into the top of the window frame. Shades can be adjusted by mechanisms within the roller that allow an individual to control the length in which the shade will hang down. These window options provide the individual with the ability to control the amount of light that is allowed within a room and provides protection from glares that can occur in different areas within the room as well. Shades are available in a variety of colors that enhance the feel of the room. Indoor/Outdoor and Solar Shades are available. There are many different types of window treatment enhancements that can be purchased to create a more decorative look. Some of these enhancements include Top Treatments like Valances and Cornices.